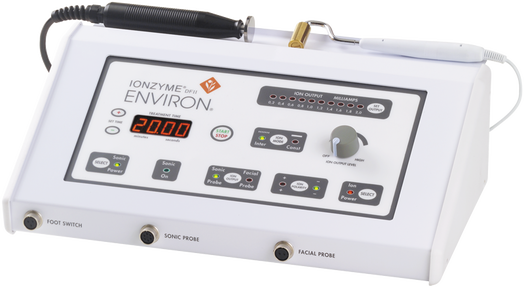 Environ's exclusive DF II Machine, specially designed for use in professional treatments, utilising iontophoresis and sonophoresis was developed to create a unique salon technology to enhance the penetration of vitamins and other active ingredients through the skin's barrier giving instant and lasting results. Treatments can be either part of a good skin care maintenance programme alongside the Environ homecare regime, or can be used as a course of 12 to target specific problems such as hyper pigmentation, light to medium expression lines, or lack of vitality. Results can be enhanced when used in combination with procedures such as chemical peels or laser skin rejuvenation. With sensitive skins, a slight retinoid reaction can occur while the skin gets used to vitamin A. This causes slight reddening, flaking of the skin's surface (this is rare) and generally this can be avoided by starting on low strength vitamin A products and working through the range to high strength retinols. Packed with nourishing, anti-ageing ingredients, the Active Vitamin treatment will leave your skin looking radiant and dewy. The freshest, most active forms of vitamin A, C and anti-oxidants are driven deep into the lower layers of the skin using sound waves and small electrical pulses. This scientific approach stimulates Collagen to soften lines and improve elasticity, increase hydration and boost radiance. The Active Vitamin treatment is suitable for all skin types and is particularly effective at addressing sun-damage, pigmentation, premature ageing, dryness, uneven skin tone and scarring with measurable differences after just one session. In between facials continue to use your prescribed Environ personal-use products daily. To maintain a healthy skin care regime, regular facials are advised every 4-6 weeks (or as advised by your skin therapist).